The Bottles set to pour their eclectic cocktail of acoustic flavours into the Festival this year! This year the Festival welcomes the marvellous Bottles to the line up. With their eclectic acoustic spin on songs from varying eras, the Bottles will certainly be pouring us a stiff shot of musical talent. You have played Festival in The Park previously. What do you like about performing at the festival? Behind the scenes it works like clockwork. From a friendly hello to being helped onstage, the sound being great and then the smiles and appreciation from the audience. Ashford Festival In The Park is a real music lovers festival. So tell us a bit more about The Bottles? The Bottles are: Jimmy- double bass; Dave- drums/washboard, backing vocals and percussion; Adrian- vocals, rhythm/lead guitar, harmonica and kazoo; Jim- vocals, 6 / 12 string guitar. 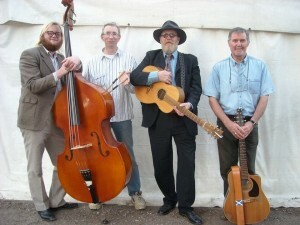 Playing traditional tunes through to the 50s and 60s and beyond, The Bottles are an eclectic acoustic band. Being exposed to music and art at any age is important. It reminds us that there’s more to life than just paying bills! You meet all kinds of interesting people and become part of a community. Festivals like this bring everyone together for a weekend of fun in the sun. Everybody is happy to be there and everybody has a good time. It makes the band step up their performance, being able to focus on musicianship and entertaining the crowd. Finally, what can we expect from the The Bottles performance at this year’s festival? Vocal Harmonies, Summery Melodies and Witty Comments.